Need to teach a unit on Paul Klee? This Artist Bundle has you covered. Paul Klee was born in Switzerland and loved both music and art. He had a unique style that was influenced by expressionism, cubism and surrealism. Klee especially loved bright colors and simplicity in his painting. He painted objects that encouraged people to feel emotions rather than painting a realistic object. He liked to paint with as few lines as possible. Sometimes the objects or people he painted looked more like colors and shapes rather than the real thing. This is called abstract art! 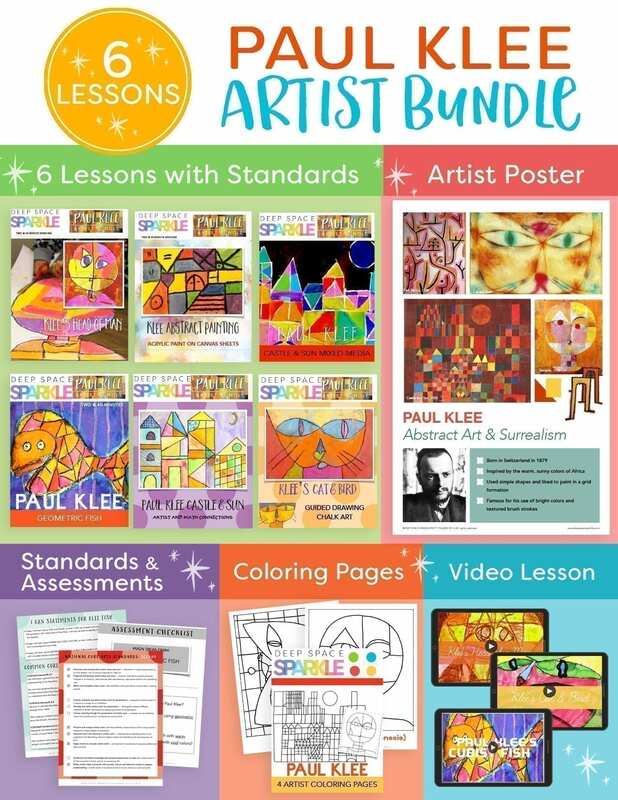 This bundle includes kid-tested art lessons that are easily taught, even if you don’t consider yourself and artist. Klee’s artwork is easily appreciated by children and is a popular artist to study in the elementary art room. It includes everything you need to introduce Klee and his kid-friendly art concepts of color, composition and line to children in grades K-6. The lessons can be adapted for multi-age kids. Learn how to teach CUBISM to upper and lower elementary students by following my teacher scripts, cool techniques and engaging art lessons. No fancy supplies required. I use basic art supplies like liquid tempera paint, watercolor paint, regular drawing paper, oil pastels, chalk pastels, markers and Sharpies (or waterproof black markers). Each lesson includes Common Core Standards, I Can Statements, National Visual Art Standard Checklists, plus a quick Assessment Checklist. ****DO NOT PURCHASE THIS BUNDLE IF YOU ARE A SPARKLE. It is included in your membership! This bundle will be featured in March 2017 inside The Members Club…FULL access for a low monthly fee! The Members Club offers a monthly art curriculum, a growing bank of art lesson plans, live monthly teacher trainings, and a vibrant community of teachers to support and celebrate YOUR success.